STANDARD AND HEAVY-DUTY DRUM HEATERS. Totally integrated heating systems feature wraparound spring fasteners and encapsulated thermostatic controllers with adjustable settings. Standard 3"W grounded models quickly heat steel drums. Heavy-duty 4"W units have nickel-iron heating elements insulated with fiberglass and laminated between two layers of silicone rubber-impregnated fiberglass cloth with dense grounding grid. 120V units include 6' power cord and plug. 240V units do not have plugs. 1-year warranty. UL-listed. IN STOCK. Wraparound silicone-coated enclosure includes an easy-to-use digital temperature controller with audio/visual alarm that adjusts from 50450°F with max. 1600W for steel drums; 50160°F with max. 720W for plastic drums. Positioned within the lower one-third of blanket, knitted heating elements will not overheat when drum is partially full. Unit fits 22-1/2" dia., 55-gal. steel or plastic drums. Also includes Velcro closure and 6' cord with standard plug. SPECIFY DRUM TYPE: A - Steel, B- Plastic. IN STOCK. For any silicone type heater. FOB OHIO. 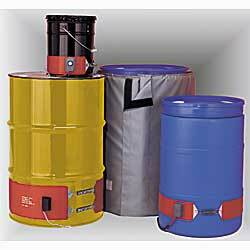 Designed for freeze protection and viscosity control of stored materials. WC-3120A Wt. 22 lbs. Steel	 120V,	 13.3 amps. WC-3120B Wt. 22 lbs. Plastic	 120V,	 13.3 amps.